Roma falls into a weird personal subcategory of films: The movies I admire greatly but don't—can't—quite love. The craftsmanship that went into Alfonso Cuaron's vision of life in Mexico in the early 1970s is compelling. It's a treat to watch his camerawork as he moves and spins about an upper-middle-class family's home from the point of view of the housekeepers charged with making sure the kids get to school and the home stays (somewhat) clean. The stark black and white imagery helps reveal the deep focus and precise framing of Cuaron's shots, each one a portrait to unpack whilst we overhear snippets of conversation about an in-progress divorce that remains on the periphery of the action until the closing moments. The performances feel natural and unforced, culminating in a serious meditation on life and how we choose to live. Cuaron's subject is not the well-to-do family falling apart, as one might expect in a film that calls to mind the languorousness of Antonioni, but Cleo (Yalitza Aparicio), the family's servant from the Mexican countryside. The director is almost perverse in his desire to keep Sra. Sofia (Marina de Tavira) and her failing marriage on the margins: We hear conversations taking place offscreen and see fights in the corners of rooms, the camera acting as an invisible viewer mimicking the way household help manages to stay imperceptible from their employers. The viewer will find himself coveting more information about Sofia and her dissolving marriage even as a whole world of drama unfolds in Cleo's life: an unplanned pregnancy, a mate who has fled to the country, the appropriation of her village by the government. Roma is one of those rare films where you find yourself in awe of the command the director displays. At one point near the end, I found myself begging, practically bargaining with, Cuaron to take no more from Cleo and her wards, to stop inflicting suffering on the people we've met over the last two hours. Never before have I felt as aware of the idea of filmmaker-as-god as I did at the film's climax. And this might help explain why, exactly, I left the theater feeling so chilly as the credits rolled. 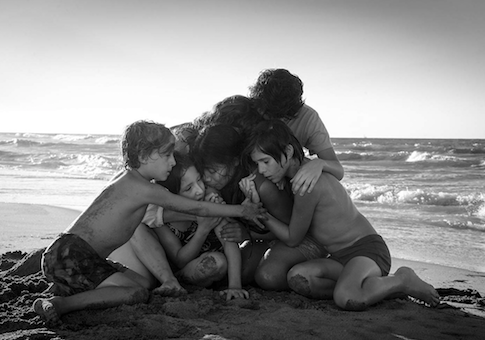 Roma certainly isn't a cold film—it features the only scene in a major motion picture this year that left me in tears, a wrenching moment of loss during which Cuaron's camera finally comes to rest, allowing us to soak in futility, helplessness, and despair in equal measure. No, Roma‘s not cold, but it is calculating. You can almost feel Cuaron pulling your strings, a jealous deity happy to make you squirm in your seat while you beg for mercy. Speaking of trickster gods who enjoy making you uncomfortable, the Coen Brothers' The Ballad of Buster Scruggs may be the best movie of the year. Consisting of six vignettes tied together not only by setting (the Old West) but also by a mordant fear of our own ever-looming mortality, The Ballad of Buster Scruggs alternates between dark, lunatic humor and darker, depressing morbidity. In other words, it's The Full Coen. 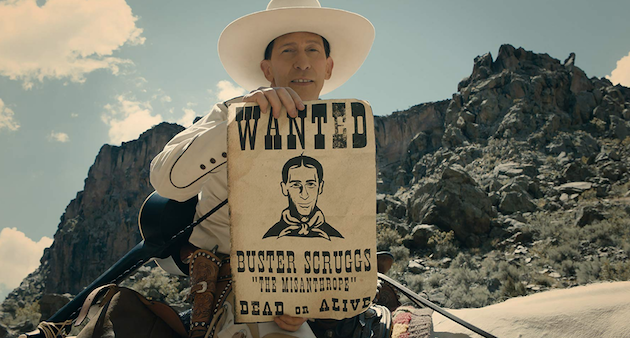 The first short story tells the tale of Buster Scruggs (Tim Blake Nelson), a singing cowboy whose sociopathic tendencies provoke dark guffaws. The second involves a robber (James Franco) who can't catch a break—until he does. The third is a dark story of changing tastes, one in which a brilliant armless, legless orator (Harry Melling) finds himself in competition with a mathematically inclined chicken. The fourth follows a prospector (Tom Waits) who befouls nature, bringing with him the evils of men in pursuit of riches. The fifth, about a woman (Zoe Kazan) headed west at the behest of her failure of a brother, demonstrates the folly of living your life at the commands of others. The sixth, and final, segment is Stagecoach as imagined by Poe, a one-act play about the journey to that great rodeo in the sky. There are many Coenesque flourishes throughout, little asides and perfect timing that underscore their acerbic wit. Their mastery over their actors is complete, the brothers able to calibrate performances perfectly in order to obtain the desired effect. They know when to go broad (Nelson's Scruggs) and arch (Jonjo O'Neill's Englishman in "The Mortal Remains") and earnest (Bill Heck in "The Gal Who Got Rattled"). You see these tics repeat, occasionally, as when a bank teller played by Stephen Root clad in pots and pans yells "pan shot!" every time a would-be robber's bullets clank off him and, later, a gunman yells "dog hole!" each time a savage charging at him on horseback goes down thanks to a prairie dog's protuberance. Even this repetition, however, speaks to a deeper meaning about the nature of the world. Sure, there's some planning involved. But we should never underestimate the role fortune plays in our fate—and we should call out our thanks each time it spares us. I review these two films together because they're both Netflix productions and it is worth taking a moment to think about how, exactly, we watch them. Roma was shot in 70mm and mixed with Dolby Atmos in mind. I was lucky enough to see it on a big screen with a theater-quality sound system and it's worth seeking out such an experience if you can find it—Roma is playing in a few venues ahead of its release on the streaming service next week. It's not just that the picture quality demands the largest screen possible so as to best absorb Cuaron's meticulously framed and positioned shots. The sound design is just as precisely organized, with audio sources shifting and sound drifting from speaker to speaker as characters move through rooms and streets and hospital corridors. The effect of all this is to both insinuate the audience into the action yet still keep us at an arm's length, on the periphery—again, mimicking the life of a household servant, that invisible-yet-ever-present presence felt in any home with a domestic. The effect might be the same at home on your laptop speakers, but I doubt it. I saw The Ballad of Buster Scruggs, meanwhile, at home, on my TV, and I couldn't help but wonder what I might be missing. Sure, there's the grandeur of the western landscapes shrunk down from 40 feet to 40 inches, but that's all to be expected. What tricks of sound might I be missing? What distractions—from my phone, from my child—might draw me from the screen for a moment and cause me to miss some important clue as to the meaning of the movie? Yes, it's an episodic film, structured as a series of short stories. But this film is more than the sum of its parts, a dark reminder that death looms and the only way to truly live is by being true to one's self. As one character remarks near the end of the picture when retelling a story about being asked to play a hand of cards for a man while he stepped away from the table, "How a man wagers, it is decided by who he is, by the entirety of his experience of poker up until the moment of that bet." Life, like The Ballad of Buster Scruggs, is a unity: One event flows into the next, even if everything you see appears to be separate from everything else. Watching this, or any other, movie piecemeal undercuts that message, chops it up into a series of unrelated stories, disrupts the flow, makes a mockery of the storyteller. It is undoubtedly possible to watch a movie this way—but it is far from ideal. And this, in the end, is the Netflix paradox. The streaming giant, flush with venture capital and throwing it about willy nilly, has made possible a number of achievements by empowering a number of artists to create work that other studios, cramped as they are by the demands of box office revenue, never would have bothered with. But they offer it to us in a way that is less than ideal, a way that offers a sub-optimal visual and aural presentation, a way that lends itself to distraction and disturbance. We should be happy with what we have. We must be sad about what we've lost. This entry was posted in Culture and tagged Movie Reviews, Netflix. Bookmark the permalink.